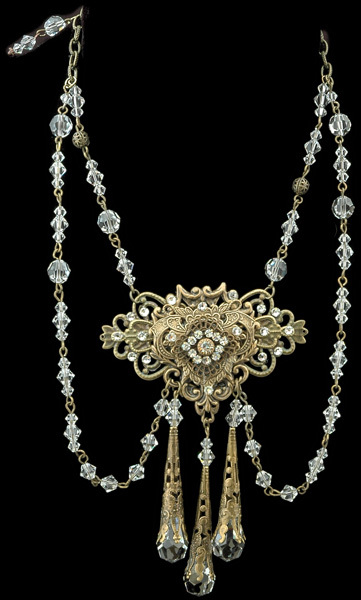 My Victorian Crystal necklace sparkles in all clear Swarovski crystal beads and layers of antiqued gold brass filigrees. The chain is handmade using pins and round and bicone shaped crystal beads. The gorgeous center focal point is made with layers of antiqued brass filigrees and dotted with tiny clear crystal rhinestones. The 3 drops held below it are crystal teardrop pendants encased in elegant filigree torch bead caps. Wear this with my Victorian Crystal earrings to finish off the look.